Today I had my first meeting before Common Council, where I had to make a few short remarks before the meeting began in earnest. For those who wish to know more about the City of London Corporation and the role of an Alderman or Broad Street Ward, there is plenty to surf. If you don’t mind getting a bit of magisterial oversight from me, the Banking Technology Awards applications close soon – http://www.bankingtech.com/awards/awards-judged-categories/. It’s a great opportunity to showcase good work, and a great event. I thank Sir David Lewis for leaving the Ward in such fine shape. I am honoured to have the support of three excellent Councilmen, including my friend and Deputy, John Bennett, John Scott and Christopher Hayward. I know that I have your support and look forward to learning from you and working with you in finding ways to increase the City’s attractiveness to businesses and residents. Regretfully, I shall probably make a few false steps along the way. May I petition in advance your understanding and guidance when I do so. May I thank you all for your encouragement and I look forward to serving with honour. I guess this is along the lines of “The Alderman has retired, long serve the new Alderman”. Yesterday, Thursday, was also election day for Broad Street Ward Alderman. My opposing candidate and I spent 13 hours together, somewhat nervously, but passed the time in great conversation. Though an eavesdropper might have paraphrased Winston Churchill, “The best argument against democracy is a five-minute conversation with the average candidate.” In the end, the result was 62% to 38% in my favour. Alderman Ian Luder, acting as Lord Mayor locum tenens, kindly raised a glass of champagne, and I headed off to catch the digestif at the Gresham College annual dinner of the Professors. So, what does the future hold? Well, formal installation begins next week and I hope to keep folks informed about City and Ward business, albeit perhaps slightly frequently than during the election. It is a great honour to be taking over from former Lord Mayor and Alderman Sir David Lewis, and to be working with three great Common Councilmen, John Bennett, John Scott and Chris Hayward. I genuinely look forward to your advice on how best to advance Broad Street Ward and the City. 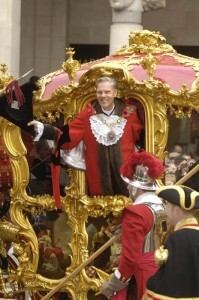 Looking forward to greeting many of you at Guildhall in the future. Today’s Wardmote at Carpenters’ Hall was well attended and lasted 25 minutes. I hope to welcome any voters from 08:00 to 20:00 on Thursday, 4 July at Carpenters’ Hall. After 29 years working in Broad Street Ward, it is with some humility that I stand before you today to ask for your vote for Alderman. I intend to say only a few words to avoid Soviet-era oratory. It was said that after one of his lengthy, repetitive speeches that Soviet leader Leonid Brezhnev confronted his speechwriter. “I asked for a 15 minute speech, but the one you gave me lasted an hour!” The speechwriter replied: “Comrade, it was 15 minutes, but I gave you four copies…”. You’ll be glad to hear I have a single copy. You also have copies of my record and services to the City in print and media, so I thought I would touch on two things not in the record, my passion for the ward and what I hope to achieve if elected. 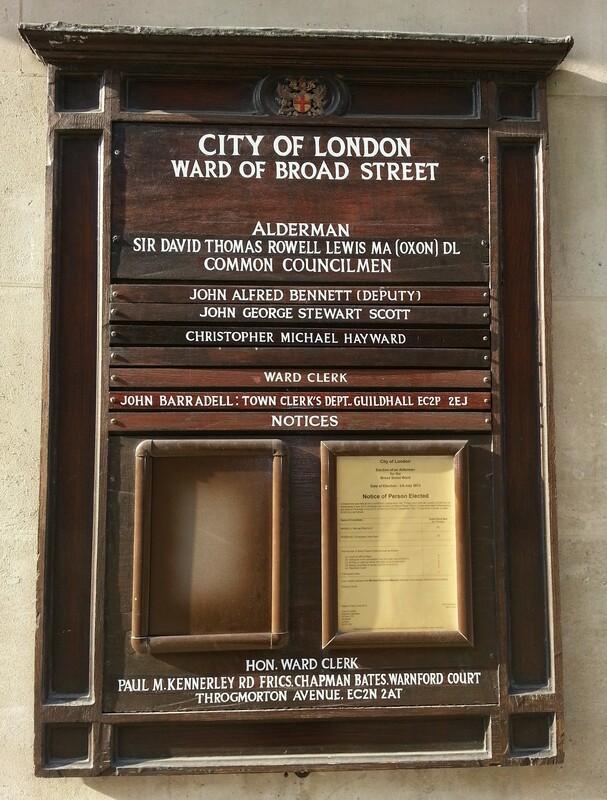 My interest in Broad Street Ward dates back to 1984 when the Stock Exchange was still in the Ward and I began working on the computerisation of businesses here. Over the years I worked in various City firms from L Messel, the stockbrokers, to being one of the senior partners of Binder Hamlyn, the accountants, and back in the ward for a few years with Deutsche Morgan Grenfell before founding Z/Yen, widely recognised as the City of London’s leading think-tank and venture firm. In 2004, I became Chairman of the Broad Street Ward Club and increased the Club’s size markedly. I am passionate about this amazing heart of the City. I do not want to be AN Alderman, I would like to be THE Alderman of Broad Street Ward, and you are the people who will decide that. What do I seek to do? Well, two things. First, from canvassing for this post I’ve learned that many businesses have closed or left the ward. Many electors have moved on or lost their jobs. We constantly need to find ways to increase the ward’s attractiveness to businesses and residents. There is a big desire among ward residents to explore ways of improving life in the ward. Imaginative thinking might do wonders with the pedestrian zone around Drapers Gardens, the opportunities of Crossrail, or the charm of Throgmorton Street. If elected, I would have six monthly informal meetings under the auspices of the Ward Club where businesses, residents and common councilmen can make strategic connections on these issues before planning begins. Toss ideas around once every six months over beer & peanuts or wine & olives. 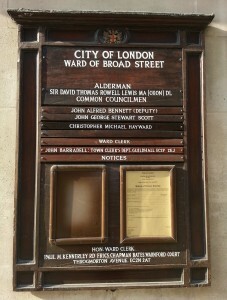 Second, I want to work from within the City of London Corporation on improving the City’s attractiveness to business. We need to show that we are open to business and treat folks fairly in the City from wherever they hail, which has been my experience. London needs to continue to dominate my firm’s Global Financial Centres Index. This boils down to two tasks – providing local government that works for all, and lobbying central government for sensible policies that are friendly to any proper business. Those are my two objectives – increase the ward’s attractiveness while ensuring that the City remains open for global business. They say that there is no difference between the Constitutions of the USA and Russia. Both guarantee freedom of speech. Perhaps, but the Constitution of the USA also guarantees freedom after the speech – and you’re now free of mine. But I do ask for your vote. Please vote for Michael Mainelli tomorrow. Thank you.